Image above: I made Bill lie on the ground to take this photo of the dual camera infrared rig, the Fled which was lifting it, and Ned's new homemade Rokkaku (which made me very envious). We had excellent weather for yesterday's meetup at the Middlebury College Organic Farm. There was just enough wind for the Fled to lift two cameras, but not too much which meant that everybody could try flying Ned's quadcopter. That is, everybody but me because the Fled was in the air continuously for three hours and I was walking it around as it took 1200 photos. The first 200 were the first aerial shots taken by Rosco, the Canon A810 with a Rosco blue filter in front of the lens and no IR block filter. The NDVI image below is derived from the red and blue channels of Rosco images. The RGB color image on the left is from the unmodified camera on the dual camera infrared rig which replaced Rosco after 40 minutes. The Middlebury College Organic Farm. Each image is stitched from 7 to 9 images (MS ICE). The NDVI image is derived from the red and blue channels of photos taken by Rosco. Click here to see the full resolution image at Flickr. After a battery change in the dual camera rig, we sent it up again and walked it around the willow biofuel trials next to the organic farm. Middlebury College installed a $12 million biomass gasification plant in 2008 as part of a goal to be carbon neutral by 2016. When it appeared that everybody else was also trying to generate power by cutting down Vermont's forests, the college started a trial to determine whether willow could be grown for biofuel. 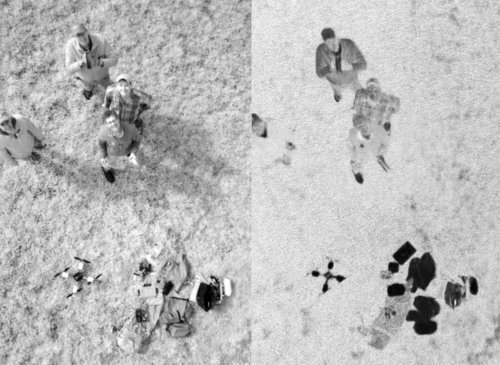 A nine acre field trial includes the variety and treatment experiment in the aerial images below. Early results suggests that 1200 acres of willow would be required for the gasification plant to supply all of the campus' energy needs from home grown willow. Images below were stitched in MS ICE. While I was dutifully capturing multispectral mapping images, Ned, Bill, and Ben were getting practice with the quadcopter. Bill took the video below with his phone which needs better image stabilization. I ran most of the clips through DeShaker to calm them down, but they got very fuzzy in the process. I suspect that's because I don't know how to use DeShaker. The dual camera infrared rig exhibited a serious and mysterious malfunction. After about 12 minutes of its first flight, the synchronization of VIS and NIR photos was disrupted. The perfectly matched pairs from the first 12 minutes suddenly gave way to non-synchronous pairs. The photos in these pairs overlap by only about half of the photo, so aligning them to produce NRG and NDVI will be tricky and unproductive. After the batteries in the MK111 timer and the cameras were changed an hour later, synchronization was perfect again and remained so for the remaining 40 minutes of the flight. I can't think of a mechanism by which low batteries could account for this symptom. Both cameras continued to shoot at each interval (10 seconds) and neither ever missed a shot. They were just not in synchrony. I assume I will never figure out why this happened or be able to prevent its recurrence. That's one reason I am really glad that I don't get paid to do this, and also a good reason for people not to pay me to do this. "Captain, scanners detect four life forms and an unarmed semi-autonomous vehicle." Desaturated Rosco superblue photo (left) and grayscale NDVI from the red and blue channels of that photo (right).